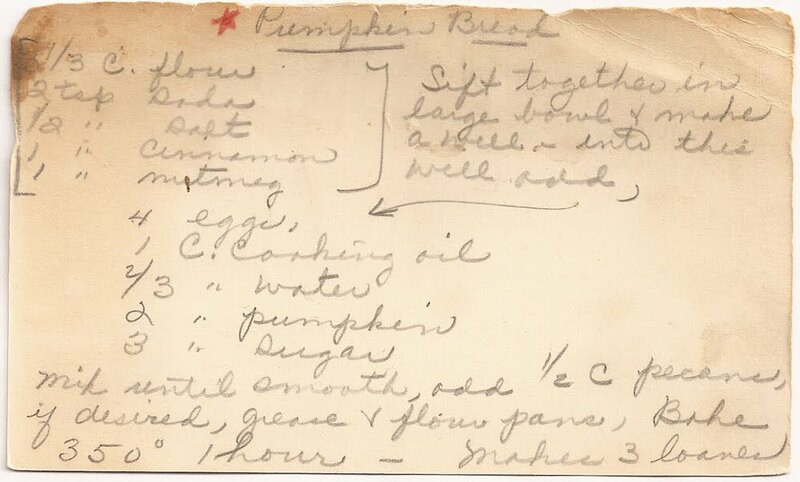 Pumpkin bread is a delicious, seasonal favorite of mine. I enjoy the tender and moist texture that pumpkin adds to quick bread. This recipe must have been this cook’s favorite, as it has a small red star next to the recipe name. The other tell-tale sign is that the recipe yields 3 loaves. You don’t make three loaves of bread unless it tastes pretty darn good. In a large bowl, sift together the flour, baking soda, salt, cinnamon, and nutmeg. Make a well in the center of the dry ingredients. To this well, add the remaining ingredients. Mix until smooth. If you’d like, add 1/2 cup chopped pecans to the mix. Grease and flour 3 pans. Divide batter evenly between the pans. Bake at 350F for 1 hour or until the bread tests done.